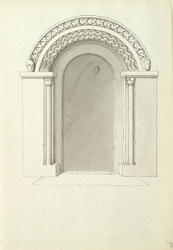 Drawing of the late Norman south doorway of St Mary's Church in Swainswick in Somerset. The small parish church is Norman in origin but only some of the Norman fabric remains, as much of the church was rebuilt in later centuries. This doorway has an arch decorated with a triple zig-zag pattern and another arch decorated with a dog-tooth pattern and two head-stops.